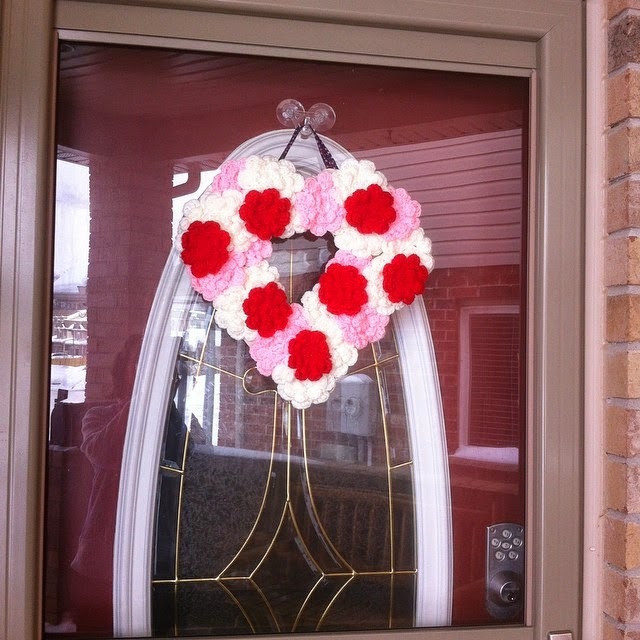 As I promised on my monthly roundup, here is the now complete Valentines Day door wreath I crocheted. I used a basic flower granny square from an afghan pattern but stopped when the flower was complete. The neighbours had installed a new toilet and had the box in the recycling. The cardboard was very sturdy so I grabbed it and cut it up. I did use masking tape around some of the rough edges. For the "hanger" part I took some 1.5" fabric I had and poked it through the cardboard, making some knots so it would not slip back out. I then heated up the glue gone and went at it. No rhyme or reason but I did know that I wanted the red on the very top layer. I made exactly enough to fill it in really well. It's about 3 layers so very 3-dimensional. Love how it turned out, if I do say so myself. Yes, it's up in March BUT ... February is a short month so it would actually be February 30th (instead of March 2nd when I finished it) - I'm sticking to that!! Now, what should I make for St Patrick's Day for the door? Would love links/photos! Thanks! !